Guy Julier is the author of Economies of Design (2017) and The Culture of Design (3rd Revised Edition 2014). A writer, academic and practitioner, he has over 30 years professional experience observing and researching global changes in design, economics and society. He is credited with having established Design Culture as a field of study and research. While he was Professor of Design at Leeds Metropolitan University (2001-10), Guy Julier founded and directed DesignLeeds, a cross-disciplinary research and consultancy unit specializing in social design. He was also a co-director of LeedsLoveItShareIt, a company formed to develop and prototype new approaches to urban regeneration. In 2011 he was appointed as the Victoria & Albert Museum/University of Brighton Principal Research Fellow in Contemporary Design and Professor of Design Culture. At the V&A he developed new approaches to curatorship while also directing the museum's Design Culture Salon. 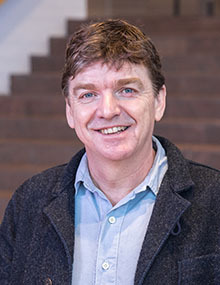 He has collaborated with the thinktank, Policy Connect in undertaking a UK parliamentary enquiry into design for public services. With Lucy Kimbell, he has led a number of initiatives and projects to develop cross-disciplinary thinking and methods in social design. His other books include New Spanish Design (1991), the Thames & Hudson Dictionary of Design since 1900 (2007) and Design and Creativity: Policy, Management and Practice (2009), co-edited with Liz Moor. Guy Julier directed the 2009 Leeds Festival of Design Activism and, in association with the Fundació Història del Disseny, convened the 2011 Design Activism and Social Change international conference in Barcelona. In 2013 he Guest Edited a special issue of Design and Culture on design activism. He was a jury member of the Bienal Iberoamericana de Diseño in 2016. He has been a Keynote speaker and workshop leader in much of Latin American and across Europe and has been Visiting Professor at Glasgow School of Art (2005-10) and the University of Denmark (2013-14) and Visiting Fellow at the Otago University (2009).